I used to stay at Loyang area which is about 5 minutes bus journey away from the Changi Village Food Centre. I came here quite often then and always for the Chicken Chop Hor Fun as well as the Coconut Drink. 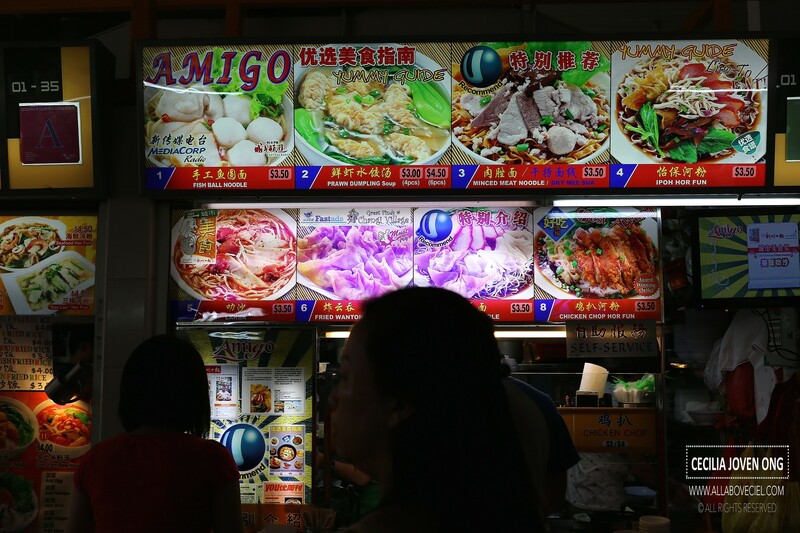 There are 2 stalls serving the Chicken Chop Hor Fun in the same row, the 2 stalls are directly facing each other and both are equally famous but Amigo is the one that is always have a constant queue. It is obvious that Amigo's is the popular choice. After moved away from Loyang, i did not get to come to this food centre as often as before. I was here quite a while back and i tried the Ipoh Hor Fun from Wing Kee Ipoh Hor Fun and ended up feeling disappointed. Their standard was not as good as it used to be and that was part of the reason that i decided to order from Amigo this time. There was about 3 customers in the queue when i was there slightly after 2 pm on a Sunday. There was a younger man taking orders at the stall, assisting the older couple there. I was tempted to try their Signature Minced Meat Dry Mee Sua ($3.50) but decided to go with my usual favourite, the Chicken Chop Hor Fun with chilli added, this is their other signature item stated on their signboard. 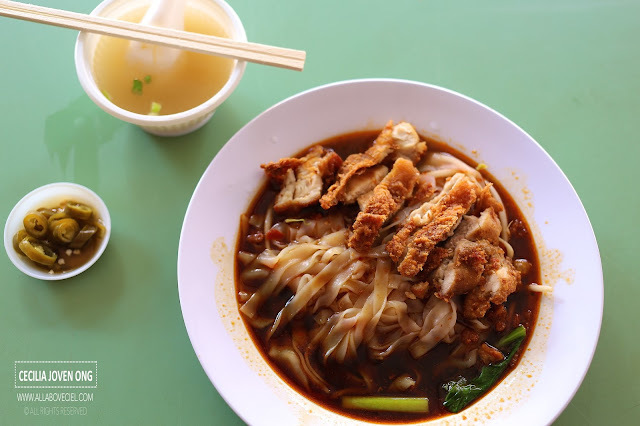 All of their noodle items are reasonably priced at just $3.50. The wait was a short one, it was ready in just a bit. The young man placed it on the tray with a bowl of soup served in a disposable plastic bowl. I am expected to help myself with the red and green cut chilies. I recognised that familiar taste when i had my first mouthful. The presentation might not be as appetising but it definitely still tasted as good and comforting. The kway teow was perfectly cooked to achieve the smooth texture and served in a pool of tasty braised sauce before topped it with a piece of perfectly fried chicken chop that was sliced into a few pieces. Though i never did ask for extra chili to be added but i could taste the distinct spiciness that actually enhanced its flavor. This comforting taste was a part of my growing up memories and tasting again actually bought back some of those fond memories.